There are 2 types of Sunday racing, Sunday series racing and the "Super-Sunday" series. If you struggle to get every Sunday off for sailing, why not try making the effort for the 6 "Super-Sundays"? Portsmouth Yardstick will be used to correct the handicap scores and the numbers of races to count will be 50% of the total + 1 unless < 4 races are sailed in a series in which case there will be no discards. Results will be published on the Derwent Reservoir SC website and facebook page. This is a new series which has been introduced to give you the opportunity of trying some different kinds of racing and to bring together all classes against each other. It's an occasion to aim for if you can't come every week. 4 short (20 minute) bullet races before lunch, each with a single handicap start. Courses will be short to aim to keep the fleet together for close contact racing and provide lots of starting practice. Afternoon (about 2pm) pursuit race for 60 or 90 minutes. (You must sign up by 1pm to allow the pursuit race to be planned). Each Sunday will be a self-contained regatta with a winner's prize on the day. Scoring will be based on best 3 scores in the morning races (1 discard allowed) and overall position in the pursuit race. The pursuit race must be raced to qualify. What is a pursuit race? This is a race where the start time is adjusted according to the boats PY handicap. The slower boats set off first with fast boats in "pursuit" Where you finish on the water is your actual result. Don't panic if you find your RO duty falls on a Super-Sunday . If you are unsure how it works after reading this do feel free to phone the sailing secretary on 01207255442. The details and dates are on the website. The format is to run 4 short handicap races (about 20 minute in length) before lunch and a pursuit race in the afternoon. Arrive at the Club with time to spare, probably no later than 09.45am just to give yourself time to plan what to do and get a cup of coffee !! Remember that the 1strace needs to start at 11.00am prompt. Aim for 4 "Bullet races" in the morning . Set a small course . Trapezoid if possible . You will need a gate to allow average lap time to be taken. 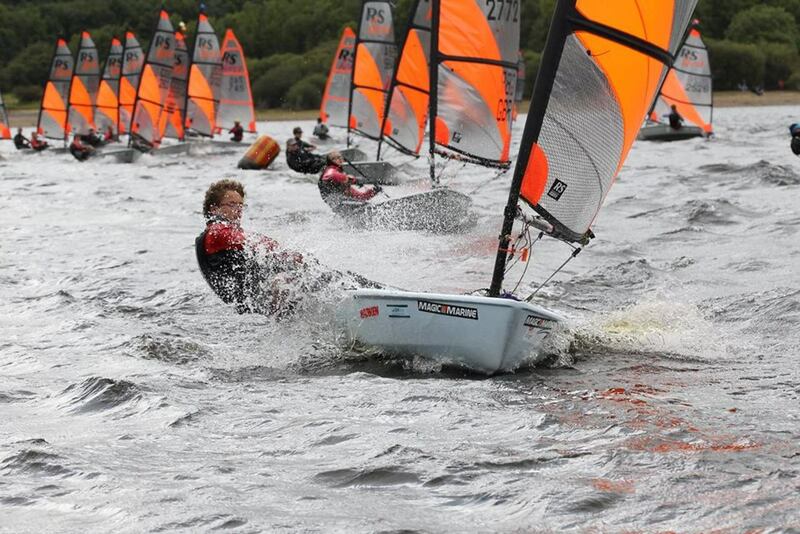 Boats must not go through the gate on the "downwind" leg. Aim for a lap time of about 8 minutes for the middle of the fleet. You will need to add extra marks. Ask the safety crew to take out 2-3 marks for the pin end of the line and to make the optimum short course. They will be happy to lay these under your guidance. Start sequence should be 4-2-Gowith a single handicap start (Flying fifteens go with the handicap fleet for Super-Sunday). Lap times should be recorded for everyboat . Slower boats will complete less laps than faster boats. secretary for the day) asap to process the morning results. Make an announcement at Lunchtime that all competitors must sign up for the pursuit race 30 minute before the start of the race (ie by 13.30). You need to know what boats are intending to race in order to plan the start times. Decide the length of the race you wish to run (depending on the conditions). Suggested length would be between 45 minutes (for really windy or cold conditions) up to a maximum of 90 minutes . The usual length is 60 minutes. The course needs to be big enough to avoid too many early starters on their second lap getting mixed up with the later starters. Use the club marks to provide long course. A Gate is suggested to help keep track of laps completed. There should be a 4-2-GO for the starting fleet (Oppie or Tera) set your clock to count up from there. Starting times for the other fleets should be posted up in the white board outside the clubhouse. Start times are calculated using the RYA website PY N 2016 put into the RYA pursuit race excel calculator. Start times should be to the nearest minute. To start, list all classes that are going to race in the class column with the slowest (Class with largest PN) first working to the fastest class. Next enter the relevant PN's in the PN column. Finally enter the race duration in minutes where highlighted in red. from here the differences in seconds will be given. these tell how much time after the first class each class must start. There will be a prepared laminated sheet for the commonest participating classes for a 60 minute race in the race officer's bag and by the club computer. Keep watching the positions of all the boats on the course and record each time a lap is completed. Start preparing to finish 5 minutes before finish time. Warn the safety crew by radio . They will track the lead boats and document the positions for you in a small fleet. If you wish to personally finish the race ask the rib to collect you and hop in with your timer, blue flag and results sheet . Motor to the front of the fleet and if the positions look set start recording the positions. In a big fleet ask a second rib to start documenting positions from the back of the fleet until you meet in the middle. Provide a sound signal and wave the blue flag at the end of the race. Ensure all flags and equipment are put back in the boxes and replaced in garage 2. Give their results to the sailing secretary or nominated committee member. There will be a presentation of results and a winner of the day prize in the clubhouse as soon after racing as possible. If in doubt ask someone for help!